UNION STATION and its stylized Navajo rug design in tile. 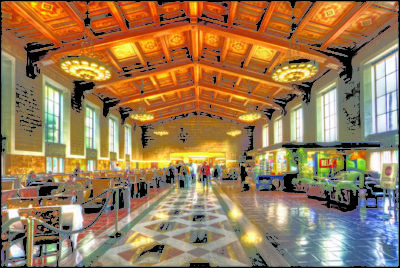 By the time Los Angeles’ Union Station opened for business in 1939 with the distinctive geometry of the Pueblo-Deco commercial spaces designed by Mary Jane Colter, the transformation of American life by rail travel was not only complete, but on the decline. Union Station was the last of the grand railway stations to be built in the U.S., designed by architects John and Donald Parkinson, also known for City Hall and Bullock’s Wilshire. In 1939, Mary Elizabeth Jane Colter (1869-1958) one of the country’s first female architects, had been working since 1902 for the Fred Harvey Company and the Santa Fe Railroad. Haven’t you always wondered about that magnificent tiled floor design near the main entry of Union Station? It is a stylized Navajo rug (some say blanket), designed by Colter. My late husband, Bill, and I loved the space, and ushered visitors into the station for a peek. The Colter-designed interiors for the Fred Harvey Company concessions at Union Station have been restored now, and, as reported in Suzan Filipek’s piece in July’s LC, the site is being readied for a microbrewery and a gastropub, pending city approvals. Mary Elizabeth Jane Colter, circa 1892. Colter wouldn’t have minded. 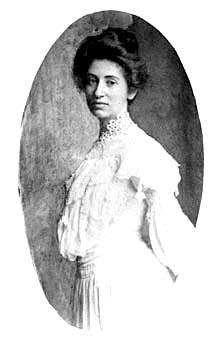 Her work for the Fred Harvey Company and the Santa Fe Railroad (the two entities split her salary) always involved commerce. She was first hired to design the interior of the “Indian Building,” which stood next to the 1902 Alvarado Hotel (razed 1970) at the Santa Fe Railway station in Albuquerque. The Indian Building was a museum and showroom of the Native arts and crafts of New Mexico, Arizona, and elsewhere. Her brilliance at showcasing these objects, and their makers, who demonstrated weaving and other work on site, caused just about every traveler to Albuquerque or Santa Fe or Winslow, not to mention Gallup, Kansas City, and Chicago, to fall in love with America’s Native heritage. The Harvey Company’s version, that is. Throughout her long design career, Colter drew in a delicious and heady mix of influences — from the Hopi and Navajo people, from the California Mission Revival (she graduated from the California School of Design in the late 1880s), the Arts and Crafts Movement, the Spanish Colonial Revival, Art Deco, Pueblo Deco, Mission Moderne, Streamline Moderne — I leave it to you to imagine these. Didn’t she live and work in interesting times? If you have been to Santa Fe, you have been to La Fonda Hotel (Rapp & Rapp and Henrickson, 1920); five years later, Colter redesigned the interiors. I sat in its lobby recently, wondering what is left of her work. Plenty. The wrought iron alone is dazzling. Colter’s iconic buildings at the Grand Canyon, Hopi House (1905); Hermit’s Rest and the Lookout (1914); and the Watchtower (1932), look as if they have been there since the beginning of time. She hired Hopi artist Fred Kabotie to paint the Snake Legend in the Hopi Room in the Watchtower. In 1945, Kabotie became the first Native person to be awarded a Guggenheim Fellowship. She served as both architect and interior designer for the 1929 La Posada Hotel in Winslow, Ariz., restored in 1997. Reportedly, it was the project closest to her heart.